Ok so legs day at the gym is usually something that I really look forward to. Don't get me wrong, I was looking forward to today - but I just felt a little tired (probably from the weekend!) and once I started with my weight, I lost interest easily. Very strange - but I guess there are those days where it happens to everyone, right? We had a drink in Camden and then went to the local Wetherspoon's for a cheap dinner. I ate pretty well all day, knowing that I wouldn't have the best pick of the food bunch when out and about. 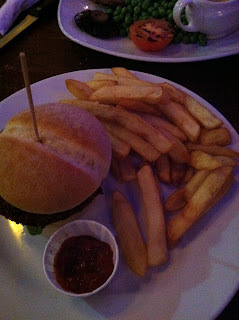 I went for the veggie burger with chips (first time in a looong time) and a pint of Carling for around 5 pounds. Bargain!